I would appreciate letters from any one who wants to pay up, or has a suggestion or comment. Just write to me at 1180 Alvarado SE, #114, Albuquerque, New Mexico, 87108. Nothing would please me more than being able to hire ten programmers and deluge the hobby market with good software. Twenty-four years ago the NSF deregulated the internet and nineteen years after the deregulation of the telecom industry people want to regulate the internet. This is insane and it is a populist move by a lame duck administration. No person ever sat around reading the Sunday paper and said “oh look honey, the government is going to regulate something, that should really make it better.” There are things the government should and must regulate and those subjects typically provide the foundation of Maslow’s Hierarchy of needs. 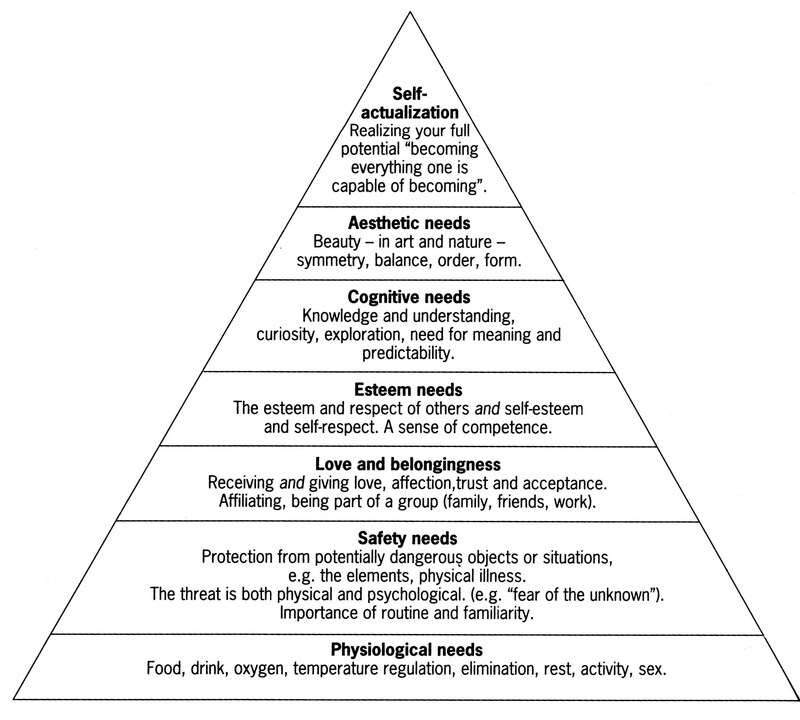 I am a network guy and building networks is important to me, but networks are not in the foundational levels of Maslow’s hierarchy of needs. In 1995, the U.S. telecom markets were on the verge of a great change. The change had not yet occurred, but companies were already positioning themselves to seize on what they perceived the future structure of the U.S. telecom market would be after it underwent radical changes in the form of telecom deregulation. The old regimes of 1995 were giant corporations of the newly labeled old economy world; companies such as AT&T, MCI, Bell South, US West, Bell Atlantic, Nynex, Bell South, Ameritech, Pacific Bell, and a host of dominant technology suppliers such as DEC, IBM, Data General, Wang, Cray, Unisys, NCR, and others. Some of these companies would emerge post-2001, while most would be absorbed in the acquisition frenzy that dominated the late 1990s and early to mid 2000s. By the time the Telecom Act of 1996 was enacted, we find that the old regimes that were part of the old economy are in crisis. Companies were dealing with an immediate and substantial change, real or perceived in the methods in which they conduct business. Almost overnight, everything was about the internet. The prevailing state of mind was that if you were not on the internet, you would not be in business in the future. This opinion stemmed from the emergence of e-commerce, defined as a form of electronic commerce in which buying and selling occurs over the public internet, or private intranets, between companies and consumers. The e-commerce revolution forced a significant structural change for global markets and the companies that comprise these markets. Information exchange and the need for information storage exploded into a massive market. The internet created trillions of new pages of electronic content. Corporate leaders were led to believe that companies that conducted business through the post, or fax machines, and telexes where incapable of functioning in the e-business world without a significant change to their operational procedures. Global reach would be made easier by the internet because it was breaking down traditional barriers between nation-states and cultures though immediacy. This assumption implies the creation of a global market on an unprecedented scale. In the mid 1990s the internet emerges onto the corporate landscape and a mechanism now exists that fosters rapid commerce between businesses and consumers on a global scale. Within the United States, there was a prevailing belief that a New Economy was emerging and it would be built on the confluence of the 1993 Omnibus Budget Reconciliation Act, NAFTA, the deregulation of the internet (1991), the deregulation of the telecom industry (1996) and the new products from the technology industries. To facilitate the emerging New Economy, a new global network would be required to support the global IT infrastructure, which was the underlying foundation. “America’s economy is even better suited for today’s rapidly changing knowledge-based economy that it was for the mass production, industrial economy of earlier times. The new bottom up economic environment is tantamount to a giant information processing system that enhances the its capacity to absorb, adapt to, and manage ongoing revolutions in technology, information, and logistics that to dynamic and complex to be handled by a top-down system, no matter how talented its bureaucracy, government, or corporate oligopoly. The marriage of a new economy and an older American culture promises a comparative advantage that will endure,” see A Second American Century, Foreign Affairs, May/June 1998, Mortimer B. Zuckerman, page 23]. The wave of telecom privatizations that started in the 1980s and continued throughout the 1990s are part of the process of change from the state ownership of key economic assets to the theories of Hayak [see The Commanding Heights, by Daniel Yergin and Joseph Stanislaw]. The idea that the state should own key economic assets is often attributed to an economist named John Maynard Keynes. Keynes was English born economist who was an economic advisor on the British delegation to the Versailles Conference in 1919. He was convinced that the harsh economic terms dictated by the Allies would reap a terrible harvest in the future and as such resigned from the British delegation. Unfortunately for Europe, he accurately predicated the root causes of the Second World War. His primary contribution was The General Theory of Employment, Interest and Money, which was published in 1936. The ideas set forth in this work would have a profound affect on the global economies post the Second World War. Keynes’s theories were rooted in the belief that the western economies were unstable and they would suffer extreme fluctuations driven by inadequate investment and savings, which are rooted in the psychology of personal uncertainty [see Yergin and Stanislaw, page 40]. The solution to the uncertainty produced by the private sector was to replace private investment with public ownership. Keynes believed that the government should make deliberate investments in public works for the public good and that these investments would serve to stabilize economic fluctuations. Post the Second World War, Keynes and his theories played an important role as the new world order set forth the economic policies of recovery. Keynes was a primary contributor at the Bretton Woods Conference, from which the World Bank and International Monetary Fund were developed. Opposed to the ideas of Keynes, we find the economist, Friedrich von Hayek, and the Chicago School of Economics. The renowned professors at the Chicago School of Economics were believers in free markets. Markets that allowed for open competition produced the best results in quality of goods and services. The Chicago School argued against government intervention and ownership, for government intervention artificially affected the prices of goods and services. The real cost of goods and services are obtained in a free market wherein unsubsidized competitive forces are allowed to react to the ebb and flow of supply and demand [see Yergin and Stanislaw, page >144]. During his tenure at the University of Chicago, Friedrich von Hayek wrote The Constitution of Liberty, which was published in 1960. In this work, Hayek argues that free markets were not enough, but rather governments needed to play a role to ensure that laws and rules were enforced. Governments do not manage economic markets – but rather manage the institutions that maintain and ensure a fair and equitable market. All of this brings us to the very early stages of telecom deregulation in the US. 1984 was the year that AT&T was broken up – but it was also the year that British Telecom (BT) was privatized. In the U.S. market, AT&T had existed with little meaningful competition until the formation of MCI. In the UK Market, British Telecom held unchallenged control of the stagnant market for telephony services. There was no competition in the UK telecom market and BT existed as a classic government managed bureaucracy. As the Conservative Government of Margaret Thatcher took control, they began to mandate new fiscal policies and BT was the first government entity to be targeted for privatization. Prime Minister Thatcher infused competitive life into the UK telephony market by allowing for the creation of competitors to BT, such as Mercury, and then forced the privatization of BT. British Telecom was forced to stand on its own as a for profit company – with no government subsidies. BT was not the only major telecom service provider to be privatized. From the early 1980s through the late 1990s, a wave of telecom privatization in excess of $154 billion dollars as well as market deregulation expanded throughout the industrialized world. In the early 1990s, the internet was beginning a remarkable transformation from a government funded research program run by the National Science Foundation (NSF), to a commercially viable network managed by private industry. This may seem simplistic, but it is really the creation of new market. A massive market that would draw in billions of invested capital and create billions in wealth. In 1991, the NSF lifted its ban on the use of the internet for commercial traffic. This was the dawn of the age of e-commerce on a global scale. In 1992, the internet contained more than one million hosts, but it would not be until 1993 that first commercial browser called MOSIAC would be introduced. The initial public offering of Netscape was the Bastille Day for the internet revolution. The California based Netscape issued five million shares of stock that were targeted to trade at $28 dollars per share. By the close of trading day on the first day, August 8 1995, the price of Netscape’s shares had raised to $72 a share, giving the company a market capitalization of $1.96 billion. A market cap of nearly $2 billion dollars is quite an achievement for a company that was less the five hundred days old and had but a single software based product that within a year would be offered for free. In terms of value creation, Netscape was able to create $125 million in value per month during its first sixteen months. Netscape’s IPO initiated a stampede towards the internet. All levels of the thought leadership within the market embraced the internet after Netscape’s IPO. Investors, entrepreneurs, bankers, consultants and venture capitalists all wanted to be part of the internet revolution. In the early 1990s, the internet was still controlled as a government funded networking project devoted to university and defense related research. The entire telecom industry within the United States was a tightly regulated business. Open market competition and government deregulation would not be enacted until the mid-1990s, but the process was starting. Agents of change were providing thought leadership within society at many levels and thus forcing the government to consider deregulating the telecom industry. The push to commercialize the internet would force the government to privatize the internet and thought leaders promoted an almost natural connection between the internet and telecom deregulation. By 1994, these changes had yet to occur, but the structural weakness of the government’s position was identifiable. The structural weakness of the government enabled the forces of change to use the political process to force a revolution in the telecom industry within the United States and abroad. Ironically, these same thought leaders are trying to push the government back into regulating the internet. It is not coincidental that telecom deregulation occurred at a time when the internet was exploding on the world and the PC was moving from a functional tool in the workplace to an essential element of the home. “We’re right at the center of the true information revolution. As these information tools become pervasive in business, on the road, and in your home, the way we will live our lives and conduct commerce will be revolutionized. I think that the idea of information available at your finger tips and instant global communication is realizable. It will happen substantially over the next four or five years. As a result, we may end up suffering a little from information overload, or spend a little more time on the couch, but I see that as a symptom of our success. Everything we’ve been talking about is going to create incredible opportunities for software companies like Microsoft that are even larger than we can imagine. And, frankly, I’m very excited about it” [see Bill Gates, Red Herring, October 1, 1993]. By 1995, the growth of the internet and its potential for business had exceeded the ability of the NSF to manage and the internet was transformed into a commercial entity and the US telecom markets were deregulated in 1996. At this stage in its development, the internet was perceived to possess a vast commercial opportunity. Networks had always been the domain of governments or private corporations. The internet presented an opportunity to develop a global public network that would be used by all people in all nation-states. Sociologically and economically, this had the potential to change the way in which societies behaved as well as to potentially alter economic development. When the NSF (i.e. government) relinquished management of the internet, it unleashed the forces of change. Three months before the IPO of Netscape another important internet company went public. UUNet was founded in 1987 as a non-profit company that provided Arpanet (i.e. early variation of what would become the internet) connections for individuals and organizations seeking a means to provide email interchange. Email was considered by many people to be the first “killer application” for the internet. In their famed Internet Report, Mary Meeker and Chris DePuy of Morgan-Stanley declared that “at a minimum, e-mail should become pervasive. So should Internet/Web access: Email is the “killer application of the Internet today, and browsing through information services the “killer app” of tomorrow,” [see, the Internet Report, Mary Meeker and Chris DuPuy, February 1996, page 1-2]. In 1990 UUNet became a for profit company and in 1992 received its first venture capital investment. As interest in the internet and connections to the internet began to accelerate in the early 1990s, private capital and revolutionary leaders found their way to UUNet. John Sidgmore joined UUNet as CEO in 1994. John was a veteran from GE Information Systems and had sold his former company to Computer Sciences Corporation. One of the major wins for UUNet was they became the backbone internet provider for Microsoft’s MSN network, which came with an investment from Microsoft. UUNet was the first company to offer commercial connections to the internet when the internet was privatized. UUNet went public on May 25, 1995. Goldman Sachs was the lead underwriter and the company raised $68 million dollars. UUNet was not the only provider of commercial internet connections. Companies such as Netcom on-line and PSINet were in business as the internet connectivity market was gathering momentum. Less than a year after their IPO, UUNet was acquired by MFS Communications for $2 billion. A few months later Worldcom would acquire MFS Communications and with it UUNet, which would become a very public component of the Worldcom value proposition and positioning of the company through the NASDAQ run-up in the late 1990s. I believe if a company builds a network or provides a service, they have the right to decide the content that goes over that network as well as the quality of the service they provide. If you want a better service, help build a better network or in the tone of Bill Gates, nothing would please me more than being able to build hundreds of networks for users to choose from and deluge the market with good networks and plenty of bandwidth. What the end-user market needs is a choice – not a regulator. I am lucky to live in a market in which Verizon, Comcast and RCN offer internet service at my home. I can also buy content from DISH and DirecTV and I have at least five mobile carriers in my home market. My current choice is Verizon for FiOS internet, DirecTV for broadcast content and AT&T is my mobile provider. The lack of choice, the lack of competitive providers in all markets is the real problem the FCC must address. In most markets the end-user does not have enough choices in terms of service providers. If you want to improve service in markets, make it easier for competitors to enter markets and offer services. I am not going dive into the Affordable Care Act and the healthcare debate in America, but that debate and the net neutrality debate do share one common, often over looked failing. We do not need more regulation and more administration; we need more hospitals and health care professionals. We need more competition not more servicers of administration and regulation. If we want to improve health care and internet services, build more hospitals, fill them full of health care professionals and build more service providers and fill them full of technology people who build better networks. For the past decade I have been a strong advocate of owning content over the asset of the network. Do you want to be the provider of water or the maintainer of pipes? Content and companies that provide content in all forms (this in includes Cloud based apps and services) have one common dependency or Achilles Heel: the network or as I now prefer to call it bandwidth. It was not long ago that people thought bandwidth was a commodity; that is a reference to the while Enron Broadband fiasco and the trading of bandwidth. The construct or blueprint of networks is changing. Not many people are aware we are going to build different networks, but all the elements are coming together just like the elevator and steel beam construction method came together to enable the practical construction of buildings greater than a dozen floors in height. The network for the most part has been stuck in the miry clay of the past. Over and over we concern ourselves with reachability and the engineering individual links, systems and ports. We treat the network as a fragile entity and scarce commodity. We have been repeating the same network design for decades. Even our regulators concern themselves with regulating the past. This is all going away and the sooner will their race be run and nearer it is to setting. We will design and engineer networks as a resource pool. We will have location ubiquity. This was the thesis of my last post. It is amazing to me how many bright people still think in classical network terms of resource constraint and scarcity. We should not be wasting days on the regulation and construction of the pipe, but rather build for the era of plenty. We should have a network that supports location ubiquity and acts as resource pool that can be provisioned to meet the needs of compute and storage. Too many people are spending too much energy on the past. In this domain, networks need to take a lesson from storage and servers. Most people will think I am referring to commoditization. To be clear, I am not. I am referring to principle that if you make it cheaper and universally available, people will use more of it. Stop treating the network as a resource of scarcity and starting building the network as a resource to be liberally spread everywhere. Regulators should be focused on accelerating the deployment of bandwidth, for bandwidth is the software of the network and those who consume it and do not pay for it, that thing can most directly be called theft. I may be proven wrong in this view, but if I owned a network, I would chaff at someone telling me how I should use it. I restrict content within the network that supports my family. If I were viewed as a service provider to my family would I be forced to provide unrestricted access to my family? Or could I tell my family that if they want a network without my control they should pay for it themselves?